Is it stranger that I have kept these photos, labeled them and put them in albums? I’ve been going through old photos. I guess I didn’t realize how many pictures I have taken over the years and it has been fun going through them. And to be honest, I had forgotten about most of them because for the last 7 years I have been taking pictures of the same subject. As I have been going through these photos, I have come across a sort of theme. My best friend Angel seems to have enjoyed taking pictures of me with total strangers. Now I have gone through about half of my pictures and sometimes I come across a picture where I can’t remember the person’s name in the photo. I’m not talking about those. I’m talking about me in pictures surrounded by total strangers. When we were in high school a few of my friends would spend Friday and Saturday night downtown on Rush Street. We would find a place to park and walk up and down the 4 or 5 blocks and people watch. One time I drove downtown in my little T1000 (it was like a Chevette) but I didn’t know how to parallel park. I found an easy spot on a quite street around the corner from Rush and my friends suggested we just circle the block one more time before taking the spot. We did and entered Cabrini Green. Such was the adventures of a few suburban girls traveling into Chicago. This one I remember because it was the first time Angel took a picture of me with a group of people I didn’t know. They were walking by and she encouraged them to join in the picture. Look at me, I look like an Oreo. Look at those shoes! 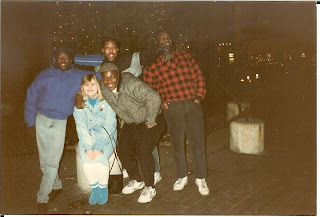 You know it’s the late 80’s because of those turquoise suede boots I’m sportin’. I loved those boots. This one was taken in Daytona Beach. Angel and I spent a lot of time in Daytona Beach over the years. Her Granny Goose lived there, she was one of the sweetest ladies I ever had the pleasure of knowing. Look at the one guy-I think he’s embarrassed to be in the picture! 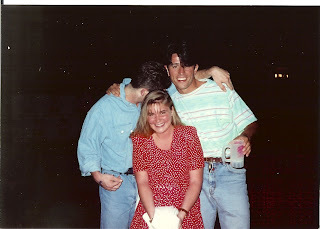 This is 1991 but I think the denim shirt kinda gives it away don’t you? Look how red my face is-it matches my jumper which also dates the picture. Remember those jumpers that used to look like a dress when you had it on? This is from one of the many John Hiatt shows I’ve seen throughout the years. 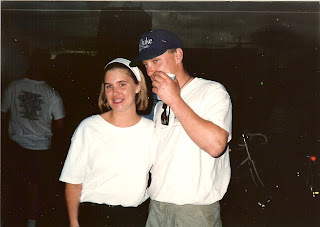 This is about 1992 and it was an outdoor venue near Grant Park. This guy has his face partially covered. Why? I’m not sure. I’d like to think he’s telling me something to make me grimace like that. This guy is kinda creepie! 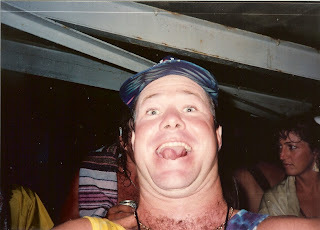 This is from the Dead pre-show in 1993 and it appears that I gave him my camera. Does anyone remember the pre-show? That was like a circus. All those people, all those “crafts”. What an experience. Wow to be 24 again and be so trusting. I know I would never let someone that looks like this use anything I owned now. I think I also need to mention that I didn’t actually attend the concert, we just went to the pre-show. We may have had to attend something else that day. Pre-show was at Soldier Field and I think we went to an event in the western suburbs later that night.